Delicia Road Conservation Park is located 105km north of Brisbane and past Mapleton on the Blackall Range. This conservation park is maintained in order to protect the remnant forest communities of the Blackall range and also serves a refuge for many wildlife species. This spectacular conservation park was left to the community by the generous Linda Garrett who used to own the land. 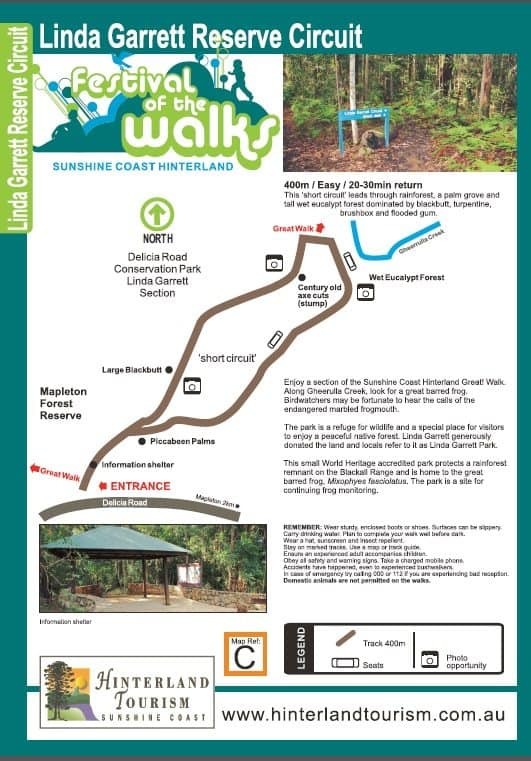 Take a walk through the short 2.2 kilometre Linda Garrett Circuit which is an easy track which takes you through the rainforest, a palm grove and tall, wet eucalypt forest. Your walk with take you along tracks and a boardwalk before you return along a fire management trail. Wear insect repellent and check for leeches after your walk in summer. To get to the park, drive to Nambour via the Bruce Highway, then take the Mapleton and Montville turnoff 17km west to Mapleton. Turn west into Obi Obi Road. Turn right into Delicia Road and continue to the park. Camping is not allowed within the conservation park, so click the link below to find accommodation near the park or in other areas of the Sunshine Coast Hinterland. Walk during daylight hours only.